← Eye of the Tiger. Rabbit. Zombie. Whatever. I know, right?! Just when I think Golden Age Superman was the height of the “Let’s twist his powers to do ANYTHING!” trend, I see that it was a well supported practice at the time. Earlier in this episode “The White Streak” (seriously, that’s his name, though he also goes by “Manowar”, which is what I would advise him to stick with) creates a ladder of electricity with his eyes upon which he runs into the Defense Department after it smashes out a window. In this panel, though, it’s the single question mark in the observer’s speech bubble that gets me. It’s like, even HE can’t believe the random BS he’s watching, becoming so befuddled that he can’t even articulate any words. Classic. Wait, you mean that’s not the way you guys travel? Out windows? On bolts of electrons? You know, the kind you spark from your eyes? How the heck to yall get around? He couldn’t just have farted out a lightning bolt and rode the thunder out the window..? 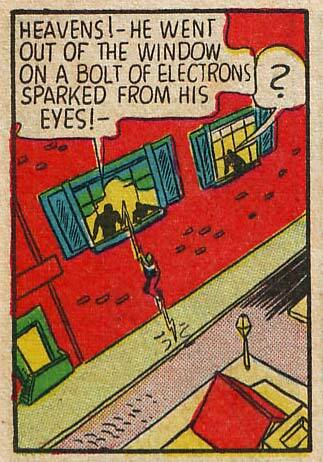 No, he’s actually climbing down an electric arc only one story high. Yeah, I don’t think I’d bother to go after him either. Yo, Vinnie, chuck a bucket of water at this chump! Where’s Snarky Sniper Action Batman when ya need him? I suppose “Brown Streak” would be worse. Hey dont try and judge someone about the spark in their eye before you get the bolt out of yours LOL. These guys need to lay off the special brownies if their seeing stuff like that. Did he slide down the electron bolt like a fireman’s pole? Or did he climb down it like the rope climb in gym? I think I’m becoming a big fan of Question Mark Man.